Our beautiful region and the bounty of locally grown food available here were enthusiastically touted in a New York Times article yesterday ("In the Berkshires, Dinner's Not Far Away"). Mark Vanhoenacker, author of the piece, writes "It's hard to dismiss the current locavore boom in the Berkshires as mere fashion. In fact, the national enthusiasm for eating farm-to-table has roots in western Massachusetts. 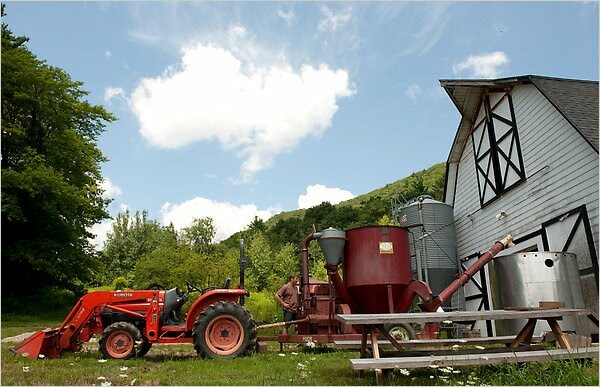 The nation’s first agricultural fair was held in Berkshire County in the early 19th century, and in 1986, when the country’s first two community-supported agriculture farms were established, one was in the southern Berkshires." Such farms, which offer a share of their harvest in exchange for a seasonal financial commitment, are now a mainstay of the farm-to-table movement. But it’s no surprise that the idea found such fertile ground in the Berkshires, said Barbara Zheutlin, director of Berkshire Grown, an organization dedicated to the region’s agriculture. Her group is another legacy of the vibrant, community-oriented food activism that was well under way by the mid-1980s."